﻿ Hebrews 3:6 but Christ as a son over his house; whose house are we, if we hold fast the confidence and joyousness of our hope. but Christ as a son over his house; whose house are we, if we hold fast the confidence and joyousness of our hope. But Christ was faithful as a Son over His household, whose household we are if we hold on to the courage and the confidence of our hope. but the Messiah was faithful as the Son in charge of God's household, and we are his household if we hold on to our courage and the hope in which we rejoice. but Christ as a Son over his house, whose house we are, if only we keep in possession our confidence and pride of hope, firm until the end. but Christ as a son, over his house; whose house are we, if we hold fast our boldness and the glorying of our hope firm unto the end. But Christ (the Messiah) was faithful over His [own Father's] house as a Son [and Master of it]. And it is we who are [now members] of this house, if we hold fast and firm to the end our joyful and exultant confidence and sense of triumph in our hope [in Christ]. 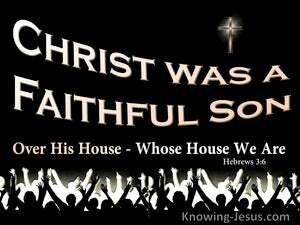 but Christ [was faithful] as a Son over God's household. And we [Christians] are that household, if we hold on to our confidence [in Christ], and to the boasting [i.e., joy] of our hope [in God], firmly to the end [of our lives]. but Christ, as a Son over his own house; whose house we are, if we hold the confidence and the joy of our hope firm to the end. But Christ as a son, over his house; whose house are we, if we keep our hearts fixed in the glad and certain hope till the end. but Christ is faithful as a son over God's house. And we are his house, if we hold fast to our confidence and the hope of which we boast. but Christ govern'd his own house in quality of son and heir, and 'tis we that are his house, provided we stedfastly persevere unto the end in the publick profession of that hope, in virtue of which we glory. but Christ, as Son over his house, whose house are we, if indeed we hold fast the boldness and the boast of hope firm to the end. but Christ was as a son, over his own house; whose house we are, if we hold fast the boldness and rejoicing of hope firm unto the end. but Christ's faithfulness was that of a son set over the house of God. And we are that house, if we keep up our courage and our triumphant hope to the very end. But Christ as a Son over his own house, whose house we are, if we hold fast the confidence and the glorying of hope, firm to the end. but Christ as a son over his own house, which house we are, if we hold fast the confidence and the glorious hope firmly until the end. And Christ as a son over his house: whose house are we, if we should hold freedom of speech and the boast of hope firm to the end. but Christ [was faithful] as a son over his house, whose house we are, if we hold fast to our confidence and the hope we can be proud of. 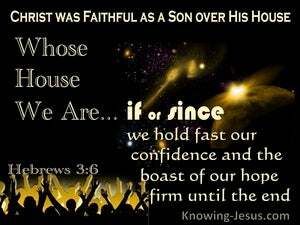 But Christ was faithful as a Son over his own house; whose house we are, if we hold fast the confidence and the rejoicing of the hope firm to the end. But Christ, as a son, hath rule over the house, whose house we are, so that we hold fast the confidence and the rejoicing of that hope, unto the end. but Christ as a Son in his own house; and we are that house, if we retain the cheerful courage and pride of our hope firm unto the end. But Christ is faithful as a son over God's house. We are of his house, if in fact we hold firmly to our confidence and the hope we take pride in. but Christ is faithful as a Son over his house; whose house we are, if we hold fast our confidence and the glorying of our hope. but Christ as a son over his house, whose house are we, if we hold fast the confidence and rejoicing of the hope. But, Christ, as, a Son, over his house, - whose house are, we, - if, the freedom of speech and boast of the hope, throughout, firm,we hold fast. but Christ as a son over his own house: whose house are we, if we hold firmly the confidence and glorying of hope stedfast unto the end. 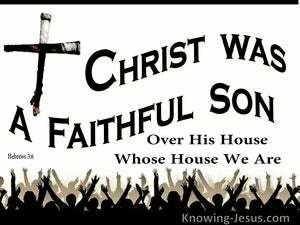 the faithfulness of Christ was that of a Son set over the House of God. And we are his House--if only we retain, unshaken to the end, the courage and confidence inspired by our hope. But Christ as a son over his own house: whose house are we, if we hold fast the confidence, and the rejoicing of the hope firm to the end. but Christ was faithful as a Son having authority over God's house, and we are that house, if we hold firm to the End the boldness and the hope which we boast of as ours. but Christ as a Son set over the house of God was faithful; and we are that house, if we keep up our courage and the joy that hope inspires to the very end. but Christ as a Son over His own house; Whose house are we, if we hold fast the confidence and the glorying of our hope firm to the end. but Christ as a Son over his own house; whose house we are, if we maintain the free profession and exultation of hope firm unto the end. and Christ, as a Son over his house, whose house are we, if the boldness and the rejoicing of the hope unto the end we hold fast. Know ye not, that ye are Gods temple, and that the Spirit of God dwelleth in you? but if I should tarry long, that thou mayst know how thou oughtest to conduct thyself in the house of God, which is the church of the living God, the pillar and foundation of the truth. For we have become partakers of Christ, if we hold fast our first confidence firm to the end. and ye will be hated by all on account of my name. But he that endureth to the end will be saved. through whom also we have had admission into this grace in which we stand, and rejoice in the hope of the glory which God will confer. Know ye not, that your bodies are temples of the Holy Spirit which is in you, which ye have from God, and that ye are not your own? And what agreement hath the temple of God with idols? For ye are the temple of the living God; as God said: "I will dwell among them, and walk among them; and I will be their God, and they shall be my people." Since, then, we have a great highpriest, who hath passed through the heavens, Jesus the Son of God, let us hold fast our profession. Cast not away therefore your confidence, which hath great recompense of reward. be ye yourselves also, as living stones, built up, a spiritual house, a holy priesthood, to offer up spiritual sacrifices, acceptable to God through Jesus Christ. Behold then the goodness and the severity of God; toward those who fell, severity; but toward thee Gods goodness, if thou continue in his goodness; otherwise thou also wilt be cut off. And may the God of hope fill you with all joy and peace in believing, that ye may abound in hope, through the power of the Holy Spirit. And let us not be fainthearted in welldoing; for in due season we shall reap, if we faint not. if ye indeed continue in the faith grounded and settled, and not moved away from the hope of the gospel, which ye heard, which hath been preached in the whole creation under heaven; of which I Paul became a minister. Let us then strive to enter into that rest, that no one may fall, as a like example of disobedience. Now my righteous man shall live by faith; but if he draw back, my soul hath no pleasure in him." but that which ye have, hold fast till I come. I come quickly; hold fast that which thou hast, that no one may take thy crown. And I on my part say to thee, that thou art Peter, a rock, and on this rock will I build my church, and the gates of the underworld shall not prevail against it.